Carry out your own qualitative respiratory fit testing for staff in order to comply with COSHH regulations and ACoP. Training in the proper use and care of respirators has been mandatory in the Control of Substances Hazardous to Health (COSHH) regulations since 1989. The 2002 revision of the COSHH regulations and the Approved Code of Practice (ACoP) now requires that fit testing of Respiratory Protective Equipment (RPE) be carried out. If you use RPE with a tight-fitting face piece, you should make sure that each wearer undergoes a fit test, with many main contractors now demanding this from their sub contractors. After all if the RPE does not fit, it will not protect the wearer. Conducted by trainers that are Fit2Fit accredited, recognised by HSE and BSIF. For up to 8 delegates. 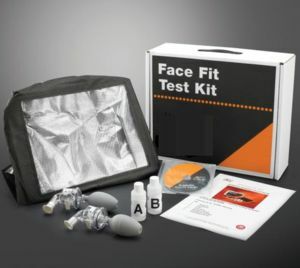 Includes a Face Fit Test Kit (RRP £130) which should allow for Face Fit Testing of 30-40 staff. Upon completion delegates are certified to conduct Face Fit Tests (for up to 5 years), with the Certificate providing a record such as required by HSE. Replacement parts of the kit are available. Once successfully tested Face Fit Test ID Cards are also available and allow individuals to prove they have passed a face fit test for a specific mask. The card includes: Trainee's Name, Mask Type, Trainer's Name and Date. Those who pass the Face Fit Test and who hold a card will be seen to be certified for 5 years for the particular make of mask tested. However if their facial features change, such as through significant weight loss / gain or substantial dental treatment they will will require to be retested. Please contact a member of our Sales team on 01322 274226 or email sales@fixmart.co.uk for more details and to book a date for your Training.